Bright White Clearcoat 2003 Dodge Ram 2500 Laramie 4WD 6-Speed Manual Cummins 5.9L High-Output Turbodiesel Cummins 5.9L High-Output Turbodiesel, 4WD, ABS brakes, Compass, Heated door mirrors. Hello, I would like more information about the 2003 Dodge Ram 2500, stock# T16325. Hello, I would like to see more pictures of the 2003 Dodge Ram 2500, stock# T16325. 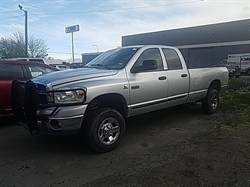 Ready to drive this 2003 Dodge Ram 2500? Let us know below when you are coming in, and we'll get it ready for you.